WD Scorpio delivers best-in-class performance with power requirements comparable to much slower drives. In addition, you'll get the quietest 2.5-inch drive on the market, and the one with ruggedness, reliability, and data-protection features that actively watch over valuable data.WD Scorpio spins at 5400 RPM for fast performance but has power specifications similar to slower 4200 RPM drives. Low power consumption yields longer battery life and increased overall reliability. It features WD's exclusive WhisperDrive technology with SoftSeek algorithms to deliver the quietest 2.5-inch hard drive on the market.WD Scorpio provides ShockGuard to protect the drive mechanics and delicate platter surface from shocks, both when it's in use and when it's not. This leading-edge technology enables WD drives to meet the highest combined shock tolerance specifications in its class: 250 Gs while in operation, 900 Gs when it's idle. DuraStep Ramp locks the heads off the data disk to provide additional shock protection. 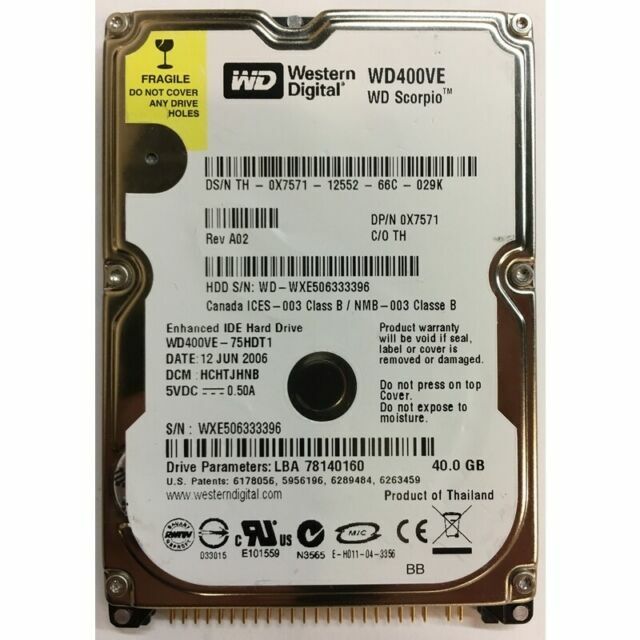 Utilizing the most technologically advanced material available on the market, the drive is able to execute a minimum of 600, 000 load/unload cycles without contamination - up to twice the performance of its competitors.WD Scorpio has a rigid stainless steel cover, unlike other devices, that will withstand greater than 5 pounds of pressure - nearly 1.5 times the industry average without pinching the motor hub or other internal components. This hard drive is plenty quiet and fast for my needs. Of course, I bought this used and it is working perfectly in my Dell Inspiron 2650 Laptop.